It was just the driving rain and the liquidity of the mud that made them look like a child’s footprints. Robert had no idea how long he had been following them, or even why. He wondered if he was simply keeping himself busy, distracting himself from the squealing in his ears, the festering wound in his thigh, the cold numbing his face and fingers, the knowledge that everyone was dead, that he was alone and lost in this cemetery, this sewer, this labyrinth. These trenches. He turned a corner and a fat crow struggled up into the black sky, its belly packed with flesh; something like a wet, red ribbon trailed from its beak. The remnants of its meal regarded Robert with vacant sockets. Despite the best endeavours of carrion and necrotising bacteria, it was still possible for Robert to see that the infantryman had been a relative newcomer to his twenties when he’d met his end, at the very least five years Robert’s junior. It was an unusual sight, a complete corpse. The dead, unable to take cover, were normally hammered by artillery fire, until there was little left but pulp and bone and scraps of uniform. Once, Robert had found the upper portion of a man’s mouth, complete with what was clearly a first attempt at a moustache. Some of the men had laughed about it – Butterworth, Morgan, Taylor, McGinnity. “The wife’s is more impressive,” said Butterworth. “Looks like a caterpillar,” said Taylor. And then the gas had come and the conversation had died. Robert knelt in the cold mud, scattered shell casings jabbing at his knees like the accusing fingers of the barely buried dead, and prayed. He stood, took off his great coat and draped it over the corpse, covering the face. Somewhere nearby, a few miles at most, the war was still going on. He could hear it, the rhythmless percussion of rifle fire and artillery. He could, after months on the line, differentiate between the sounds of the British and the German weapons – even with the wretched squealing in his ears (an everlasting residue from the first artillery barrage he’d had to endure). He wasn’t certain if the footprints were taking him toward those sounds or away from them, but he followed them all the same. The trench zigzagged, never straight for more than four yards. 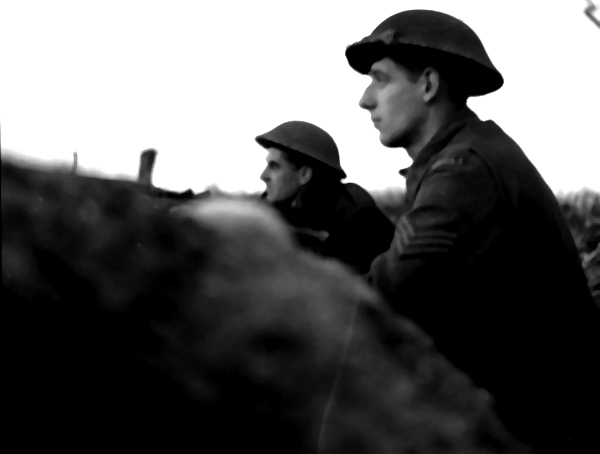 Other trenches branched off – Robert had no idea where they went – and from these, more footprints, made small by the rain and the suckling mud. There were five sets of footprints now, maybe more. Robert followed. He began to wonder if he was moving in circles: everything looked the same. The same twisted sheets of corrugated iron, the same rags of tarpaulin, the same coils of barbed wire, the same seeping sandbags, the same bewildered rats, the same shattered crates, the same scattered detritus (broken rum bottles, dented aluminium cups, old photographs, blurred-ink letters..). If he was moving in circles, he hoped he’d stumble upon the crow-torn corpse again; if he did, he would have to apologise to the infantryman and take back his great coat – the icy rain was relentless, thick and oily; uncleansing. Then again, sometimes cold was better: warmth would only serve to resurrect the innumerable lice occupying his hair and flesh; and then the biting would start. Something colourful caught his eye, ahead of him on the ground, half-buried, and then he was falling. The wound in his thigh became new, a sudden source of searing heat. It was like being shot all over again. And with that re-experience came a memory of fire, of flying mud, of the world trembling, convulsing. He remembered McGinnity snared in barbed wire, struggling to free himself, as his uniform became a mess of smouldering holes. He remembered Taylor removing Morgan’s misshapen steel hat, then screaming as a large portion of his head came with it. He remembered Butterworth, on his back, staring, unblinking, open mouth filling with rain and mud, arms outstretched as if to fend off the falling sky. Taylor began a prayer that a throatful of blood prevented him from finishing. The pain of his renewed wound eclipsed him, he wasn’t certain for how long; it could have been a few seconds, could have been hours. However long he’d been in darkness, the bright object was still there when his eyes reopened – an arm’s length away, all yellows and blues and oranges. A wooden Indian elephant. His father had brought back one just like it from Bengal, and Robert had passed it onto Bertie on his third birthday. It wasn’t uncommon for the men to bring such keepsakes with them to the trenches, not so much a memento of their own children as a reminder that such innocence existed at all. Robert had brought no such thing with him when he’d been sent up the line, thinking it would only make the experience that much more painful, that it was better to forget the past and ignore the future when the present was so utter. But now that he had seen the toy, so much like Bertie’s, he longed to touch it, to smell its paint and varnish, longed for its lustre, weary of greys and browns. He tried to stand, to move toward it, but the pain in his thigh and something looping his ankle kept him in place. He turned onto his back, looked down at his feet. Barbed wire, like a skeletal snake. He tried to flick his leg free but the fleshless serpent sank its teeth into him. It must have been venomous, that snake, because the instant it bit him, his temperature soared, the heat flaring out from his bullet wound like the shockwave from an artillery strike; the squealing in his ears became a shrieking; and his muscles began to spasm, turning from water to stone, stone to water, water to stone, until he thought they’d tear themselves apart. He’d forgotten all about the wooden elephant, until a voice cut through the shrieking in his ears. Silence. Silence so abrupt Robert thought he’d gone deaf, his eardrums finally collapsing under the strain. Then, that voice again. Robert turned in the mud, ignoring the rusty teeth working their way down to the bone. He pushed himself up onto his knees and looked to the source of the voice. The uniform fit perfectly, everything in proportion. No such adjustments had been made to the rifle, however, which was a good foot or so taller than Bertie. There were more children, skulking behind the first, clutching their ridiculous rifles. One boy, eyes big as Florins, took a swig of rum, grimaced. Another, red curls sprouting from beneath his steel hat, drew deep from a wiry cigarette. The smoker nodded, fumes trailing from his nostrils. He flicked his cigarette to the ground. It hissed as it struck the mud, a couple of inches from the toy elephant’s playful colours. From somewhere out of sight a juvenile voice yapped unintelligible orders. The boy (“… God, I’m begging you, not Bertie…”) reached into his breast pocket and took out a folded scrap of mud-stained tarpaulin. He unwrapped it, slowly and carefully, as if it was a chocolate bar and he didn’t want to lose a single crumb of sweetness. “I’m a man now, Daddy,” he said. “A man. Look.” He slapped the severed lip beneath his nose, tacky, rotting tissue adhering it to his own hairless flesh. “A man. See?” It was a poor fit, overhanging his mouth, so when he spoke, Robert couldn’t see his lips moving, an act of grotesque and deceitful ventriloquism. “I love you, Daddy,” said the boy (“…not Bertie…”) from beneath borrowed, lifeless flesh. He turned and marched away, his rifle gouging a path in the mud behind him. “Bertie!” cried Robert and lunged forward. There was a sound like tearing fabric, a sharp report like snapping wood, and he realised the black cloud prowling the periphery of his vision was altogether darker than the onset of unconsciousness. For a second, he thought he could smell the rosemary and sage that grew wild in an untended corner of his garden, and then the cloud engulfed him.